Outdoor sitting is pleasant when the atmosphere is arranged accordingly. If you are planning to host an outdoor gathering or to enjoy spending time outside when the weather is cold, you may want to invest in a fire pit or patio heater to make the atmosphere more comfortable. This article offers a detailed insight into both that will make you evaluate your need and help you in your purchase. Here are the shortlisted fire pit and patio heater reviews that will help you choose the one you most need. This fire pit could be considered a prototype fire pit product since it is one of the simplest models available. Its dimensions are suitable for standard size yard, and the simple cross-weave design complements the surroundings. A lid is provided with the product so that the fire is not uncovered, but this lid is not very durable. Innovative design and practicality come together in this fire pit. The star and moon cutouts make the design of this fire pit unique. Apart from being visually appealing, this product is also sturdy and durable. Assembly is simple. The lid included with this product is durable as well. A safety handle is also part of the design so that moving this fire pit while its hot does not hurt anyone. This square fire-bowl is a perfect option if you do not wish to opt for circular fire pits. Although at a higher price range, customer reviews suggest that the investment is worth it. The marble and slate tile table and lava rocks give this product a very sophisticated look; the table allows you to place cups and other small items near the fireplace. This fire-bowl also has variable heat settings, which other related products often do not. With several great customer reviews praising it, this product lives up to its word of being a durable, lightweight, smokeless fire pit. 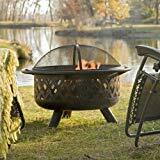 It is recommended if you are searching for a fire pit to take for camping since it will be easy to carry. Because of its small size, it can be placed wherever required, whether it be on the floor or an elevated surface. The fire will take some time to reach its maximum size but once it does, it will provide ample heat. Standing seven feet tall after assembly, the patio heater is quick to do its job and has an excellent heat range. Its stainless steel modeling prevents against rust, increasing durability. Ignition is a simple one-step process and the heater is quick to rise to desired temperatures. Because of its tall size, some customers have modified it themselves to make it suitable; be sure that you can use such a tall patio heater safely where you plan to place it. Because of its towering size, it might topple if faced by strong winds. If you are searching for a patio heater that is small and placeable on your tabletop, then this product should be your pick. It has a simple design and small size, but it heats up adequately. The product is designed for small patios and is lightweight so it can be moved around with ease. However, winds can topple this heater over, especially if placed on a table. The first question that comes to one’s mind is whether one should invest in a fire pit or a patio heater. After that is sorted out, there are several things to consider while choosing your specific product. Fire pits have the advantage of giving a more natural, homey feel in comparison to patio heaters because they generate a flame. Wood, lava stones, coal and gas can be used to light fire pits. They are also more suitable to place in a yard or a more open space, so that people can comfortably sit around it in outdoor gatherings. Another benefit that comes from having an actual flame is that it can be used at bonfires to roast food items, such as marshmallows or nuts. Whereas, patio heater products are not available in a large variety of designs and sizes, fire pits are available in a multitude of sizes, shapes, and styles thus they are the better option if you are looking to add a particular element of décor. Patio heaters are a more practical solution to heating. The most significant advantage that they have over fire pits is their safety factor; they are much safer to use around children since they do not generate a flame. Patio heaters can either be electrical or gas powered. Gas patio heaters can either use a main supply of gas or propane cylinders. Another primary advantage patio heaters have over fire pits is that their design is simple and they are easier to clean and maintain. Patio heaters generally come in two varieties size-wise; taller patio heaters are suitable for placing outside to heat larger areas, shorter patio heaters can be placed on table tops. Buyer’s Guide to the best Fire Pit and Patio heaters for a perfect home. You may look for different features depending on where you plan to place the product. If it is to be placed outdoors, search for durable, sturdy products which will not rust. You may look for a smaller product that is easier to manage if you are planning to keep it indoors. Fire pits have more options when it comes to design. 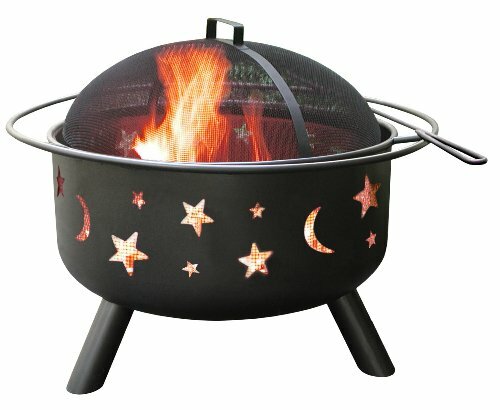 For example, the Landmann 28345 Big Sky Stars and Moons Fire Pit has a unique design with stars and moons made on it. Whereas the Endless Summer, GAD860SP, LP Gas Outdoor Firebowl with Slate/Marble Mantel is a completely different design that is both sophisticated and earthen. Your choice of design depends on your personal preference. If you know that your fire pit or patio heater is to be kept at a certain place, you would prefer it to be sturdy and a slightly heavyweight so that it is not toppled over by strong winds or other weather conditions. However, if you intend to use the product for other purposes, such as camping, then specific products that are portable are also available, such as the Heininger 5995 58,000 BTU Portable Propane Outdoor Fire Pit. Durability is a key feature of any product. The most durable products reviewed are Endless Summer, GAD860SP, LP Gas Outdoor Firebowl with Slate/Marble Mantel and the Landmann 28345 Big Sky Stars and Moons Fire Pit. This factor depends entirely on your budget. If the climate where you live is cold many months in a year, then you should consider increasing your budget and invest in the most durable and reliable product available. If your use will be limited, or if you intend to use it for events or specific purposes, then a cheaper option will do. The buying guide and the product reviews are aimed at helping customers finding the product that is most suitable for them. Fire pits and patio burners come in so many different designs, price ranges and features that it can often be challenging to decide on one. Thus, the buying guide hopes to inform the reader about the features and specifications of both fire pits and patio heaters to help you choose which one fits your needs more. The product review enlists products that are different from each other, each having its own sets of pros and cons. Altogether, making it very easier for you to choose and buy the product that best fits your home and requirements.